Ford Motor Company (NYSE: F) made money in 2011, but did it mostly with a large tax credit. So, the market tried all day to decide if that qualifies sufficiently for Ford stock to rise. The stock still closed down. Update Jan. 27, 2012 6:30 p.m. Ford Motor Company (NYSE: F) stock closed today at 12.21 down from Thurs. close of 12.79. Still, the concern over the earnings report filled the web and the airways, including Jim Cramer on CNBC's Mad Money. He noted that Ford had "overpromised and underdelivered." In other words they used OPUD when they needed UPOD (under-promise, over deliver). In my mind that means Ford, despite its great technology and product offerings, needs to temper its enthusiasm when it deals with the public, especially its equity constituents. For sure, how the market reacts to news of earnings is more important than the news itself. Such was the case with Ford stock this morning, which reported annual and quarterly earnings as a mixed bag. The daily chart here replaces my earlier, intra-day 15-minute snapshot around 10:30 a.m. showing pre-market and the open in New York. In pre-market trading, Ford stock dropped on the earnings news down to the 11.81 level. By the time Ford Motors Company (NYSE: F) stock opened in New York, though, the stock was recovering from its low of 11.79, which was well below Thursday’s close of 12.79 for a drop of 7.8 percent. According to the earnings release early Friday morning, Ford reported its best annual earnings since 1998. For the record, that makes 2011 the second most profitable year in the company's 109-year history. However, stock analysts look between the lines and search where and how the income was derived. One look at the balance sheet and you can see much of the profit appears to be attributed to a non-cash gain. According to CNN/Money, Ford put a large tax credit from past losses on its balance sheet that will shield it from taxes in the future. In my opinion, that is certainly a legal accounting move, but stock traders and investors want profits to be earned the old fashioned way, by truly earning it with product sales. Excluding that credit, Ford actually posted full-year and quarterly earnings that fell short of last year's profit as well as analysts' forecasts. Neither is good from a trader’s viewpoint. Analysts at this time of year are looking at two key areas: annual earnings and quarterly earnings. Ford’s 2011 net income of $20.2 billion was up from its net income of $6.6 billion in 2010. About $12.4 billion of the latest profit came from the accounting gain. Excluding special items, Ford reported operating income of $6.1 billion, or $1.51 a share, down from the $7.6 billion, or $1.91 a share, it earned on that basis in 2010. Fourth-quarter operating earnings of $787 million, or 20 cents a share, were down from $1.2 billion, or 30 cents, a year earlier, as flooding in Thailand had shut suppliers' plants which hurt its results in its Asia-Pacific region. According to analysts surveyed by Thomson Reuters, forecasted earnings were to be 25 cents a share. That’s a miss of 5 cents per share or 20 percent. Still, Ford has great products and a bright future. However, one can see that the analysts expected more quality in Ford’s earnings besides an accounting maneuver. Last time I wrote about Ford stock, (Read: Based on the NAIAS 2012, why is Ford stock still trading so low? ), I asked the question: How far might Ford stock move per this wedge breakout? I noted that market technicians like to use the distance from the pattern’s initial swing low or high followed by the level at which the breakout passes the wedge line for a target. 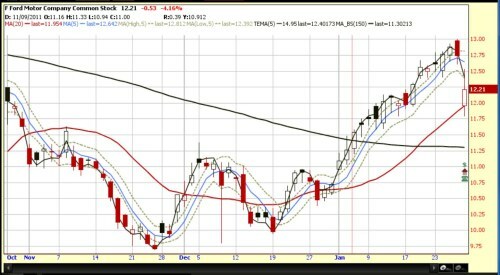 In the case of Ford stock, we had the major swing high and low as potential targets. Furthermore, the October swing high of 12.65 stood as a major resistance. If that level was breached, the 52-week midpoint of 14.01 was then feasible; but that depended on the volume of new buyers that may or may not come into the market at that point. Now that we have earnings news, we must have patience to see how the market reacts. That alone will decide the level of probability that Ford stock might rise or fall in the near future. Looking at the intra-day chart earlier this morning, Ford stock moved violently down, but found price support at the 11.79 low. Question was, would that hold? The day chart here says it did, at least for today. Monday might bring another test. I will continue to monitor the stock’s price action next week. Nonetheless, I wouldn't be surprised if Ford stock went sideways for awhile until the street absorbs the news and looks at the potential in Ford's future. Unfortunately, the option prices are not favorable to me to selling puts for income while I wait. Considering how much Ford has done in very little time, revamped its line of cars, developed new technologies, streamlined its operation and beefed up quality, I was expecting this earlier. However their success is anchored i the mind of the public. Quick searches on Google will show Ford rates very high. I agree with you, Nicolas. Ford rates high in my mind as well. The cars and tech, especially its EcoBoost defines a class act. The market, though, will girate anyway until the information dust settles. If the market pull back at all, Ford like other auto stocks will likely follow suit. I want to see price support build up before putting on any new positions. By the way, I do not own any Ford stock or options as of this date. Ditto, I should mention this every time I write a Ford article! I'm confused. Ford paid down upwards of $6 billion in debt and greatly increased liquidity. Yes they reported a tax break and earning fell short of expectations but everything else lines up to a good, stable company that is continuing to become leaner and stronger during a down economy. I only hope Ford continues to move away from making operating decisions based on the preferences of analysts for the sake of their stock price and moves closer to focusing on their bottom line and building a viable and profitable company that will withstand all economic troubles. No need for confusion; Ford is doing great. They just have to learn how to play the stock market game better. Like Cramer says, "Under promise, over deliver." One would think the finance guys would know that. I tend to believe that Ford's new cars will bring the stock back in 2012. The company has introduced some great addition to its fleet. Even Lincoln is surging. Thus, I expect these new models to rebound the stock. Frank what do you think Jim Cramer's explanation on Ford stock today? Do you agree with his position? Read my comment earlier. Cramer noted Ford as over-promising and under deleivering; his words, not mine, but I tend to agree. Now read Papire's comments and mind below his. He has a point, too. <i>"They just have to learn how to play the stock market game better":</i> I would not trust a company that would "play the market" <i> "Under promise, over deliver." </i> Some companies get sued for over promising, I think the same could apply if a company was "under promising". Investors have the right to know, and Ford did the right thing. Let it to the banksters to manipulate the markets with lies, half truths, over estimations etc. -------------------------------- That being said, what happened? We all knew that the books contained non conventional accounting, we all knew that the earning report would be bad. I took a big gamble when I went short on Ford on the 26th, mainly based on the recent reactions of the market to earnings. (covered quickly on the 27th) My feeling is that the markets did not evaluate so much the earning, since we knew before, so it had to be priced in. The markets always try to guess: <B>"And now, what's up? "</B> The economic data, even in the US, are not as good as we have thought. There is no big potential in Asia, too many strong competitors. Not talking about Europe. So America? Competition too, but most of all: too few potential buyers. Lots of Ford models are very attractive, that should be bought by a middle class... that does not exist anymore: Too expensive for the 85%, too cheap for the 1%. I think that many American will try to keep their old cars as long as possible still for a while, either because they can't afford it, or because credit is so hard to get. Corporate America has eaten the golden eggs goose. Note to Papire and Motordrive: Cramer noted Ford as over-promising and under delivering; his words, not mine, but I still tend to agree. When I agreed with underpromising, though, I meant as a conservative promotion, not this marketing hype we've been seeing and looks similar to lying when the numbers finally do show up. Fact is, most companies play the promotional marketing game in various degrees, no different than their playing of the press. It's all about image, but sometimes they get caught up in ther own marketing paradigm. In Ford's case, it's a rah-rah, we're a team and a happy one. Yes, Ford is great. Nobody smiles more than Mulally, though; and I sense too much, especially before the press and before analysts which sends that false expectation. Papire, you definitely have well-written points. However, Ford gave analysts the dog and poney show about how well they were doing; and that likely drove expectations of analysts to be higher than what they should have been. Aside from the debt that we knew about, Ford stock still popped upward, as my previous article stated, a technical breakout. Based on what? Certainly good products, but prices are high, I agree. However, in a few years, China might be eating their lunch, too. Investors deserve better assessments as they purchase stock with their hard-earned money. And if truth is what you expect, and you deserve that too, you will get disappointed until management stops this hype game for hype sake. What it boils down to is Ford missed it's own estimates, no more, no less. It doesn't mean they lost money, they didn't make as much as they thought they would. They have had great results and got too ambitious. It's hard to predict anything in this economy, anyway.